A comparison of minimum price of accounting software available on the Canadian market with the payroll module and/or payroll module constrution of Quebec (CCQ Payroll). Here are the various major players in the industry who have served in the creation of this comparative and our source for pricing dates as January 2010 ! 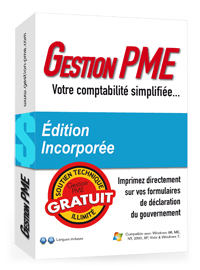 Try our accounting software Gestion PME for 30 days FREE ! Try our invoicing software also available in trial version FREE !